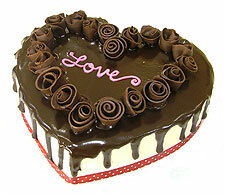 Details: 3 pounds heart shaped chocolate buttercream cake. Note:We can not deliver Cake together with other product ( ex. Flowers) because we have to deliver via special vehicle. So, we will deliver separately.